Annual surveillance mammograms in older long-term breast cancer survivors are recommended, but this recommendation is based on little evidence and with no guidelines on when to stop. Surveillance mammograms should decrease breast cancer mortality by detecting second breast cancer events at an earlier stage. We examined the association between surveillance mammography beyond 5 years after diagnosis on breast cancer-specific mortality in a cohort of women aged ≥65 years diagnosed 1990–1994 with early stage breast cancer. Our cohort included women who survived disease free for ≥5 years (N = 1,235) and were followed from year 6 through death, disenrollment, or 15 years after diagnosis. Asymptomatic surveillance mammograms were ascertained through medical record review. 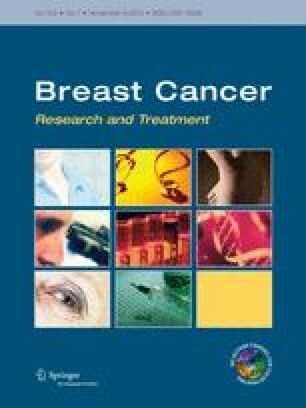 We used Cox proportional hazards regression stratified by follow-up year to calculate the association between time-varying surveillance mammography and breast cancer-specific and other-than-breast mortality adjusting for site, stage, primary surgery type, age and time-varying Charlson Comorbidity Index. The majority (85 %) of the 1,235 5-year breast cancer survivors received ≥1 surveillance mammogram in years 5–9 (yearly proportions ranged from 48 to 58 %); 82 % of women received ≥1 surveillance mammogram in years 10–14. A total of 120 women died of breast cancer and 393 women died from other causes (average follow-up 7.3 years). Multivariable models and lasagna plots suggested a modest reduction in breast cancer-specific mortality with surveillance mammogram receipt in the preceding year (IRR 0.82, 95 % CI 0.56–1.19, p = 0.29); the association with other-cause mortality was 0.95 (95 % CI 0.78–1.17, p = 0.64). Among older breast cancer survivors, surveillance mammography may reduce breast cancer-specific mortality even after 5 years of disease-free survival. Continuing surveillance mammography in older breast cancer survivors likely requires physician–patient discussions similar to those recommended for screening, taking into account comorbid conditions and life-expectancy. Supported by a grant from the National Cancer Institute (R01 CA093772 R. Silliman, PI). The CRN is a consortium of 14 integrated health care delivery systems with more than 10 million enrollees. The overall goal of the CRN is to assess and increase the effectiveness of preventive, curative and supportive interventions for major cancers through a program of collaborative research among diverse populations and health systems. We would like to thank site principal investigators Hans Petersen and Meaghan St. Charles from Lovelace Clinic Foundation and Pamala Pawloski from Heath Partners and Hongyuan Gao for her work developing the lasagna plots. We would also like to thank our site project managers, programmers, and medical record abstractors: Group Health-Linda Shultz, Kristin Delaney, Margaret Farrell-Ross, Mary Sunderland, Millie Magner, and Beth Kirlin; Meyers Primary Care Institute and Fallon Clinic-Jackie Fuller, Doris Hoyer, and Janet Guilbert; Henry Ford Health System-Sharon Hensley Alford, Karen Wells, Patricia Baker, and Rita Montague; HealthPartners-Maribet McCarty and Alex Kravchik; Kaiser Permanente Southern California-Julie Stern, Janis Yao, Michelle McGuire, and Erica Hnatek-Mitchell; and Lovelace Health Plan-Judith Hurley, Hans Petersen, and Melissa Roberts.